Among the many fascinating documents, portraits, and letters of early Methodist preachers and missionaries in the Frank Baker Collection of Wesleyana and British Methodism are a variety of woodcut prints, engravings, and other visual sources depicting subjects as varied as social satire and British birds that might be rather unexpected in a collection that is primarily concerned with religious history. As an art historian, I am particularly drawn to such visual records, and so was especially struck by both the beautiful technique and the relative completeness of a portfolio of etchings by George Cruikshank in which the artist depicts various scenes from the adventures of Shakespeare’s Sir John Falstaff. Cruikshank, a prominent nineteenth-century British artist who worked primarily in graphic media, is known for his virulent social satires and is frequently discussed alongside similarly comic-minded Brits such as William Hogarth and Thomas Rowlandson. By the middle of the nineteenth century, Cruikshank’s reputation was well-established and the artist had already completed prints for pamphlets by his friend, William Hone, a series of illustrations of the works of Charles Dickens, and the first English edition of the Grimm Brothers’ fairy tales. 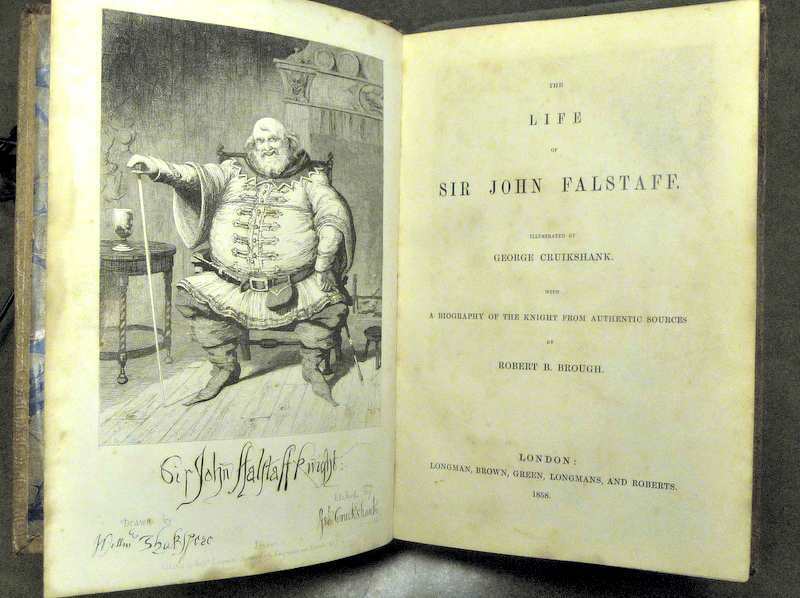 It is around this time that Cruikshank began work on a concept for a collaborative project with Robert B. Brough which, upon its publication in 1858, would be entitled The Life of Sir John Falstaff: A Biography of the Knight from Authentic Sources. A copy of Brough’s rather unusual text is available in Rubenstein Library and provides an imaginative biography of the fictional Falstaff, who appears in the Bard’s Henry IV and The Merry Wives of Windsorand who is himself believed to have been a satirical portrayal of one of Shakespeare’s unfortunate contemporaries. Cruikshank’s etchings appear throughout The Life of Sir John Falstaff, illustrating twenty scenes with expressive lines and an abundance of humorous detail in a compact, approximately 5×8” book-size format. While processing visual sources in the Baker Collection, I came across a larger set of these same prints; seventeen unbound plates on crisp white paper that are approximately 10×14” in size. The higher quality of the etched lines and cross-hatching seems to indicate that the Baker portfolio is an earlier edition. Missing only three scenes from the set reproduced in Brough’s text, the Baker Collection series begins with a print that is dated 1857 and bears a handwritten dedication along the bottom of the page, signed lightly in pencil by the artist and brought to my attention by archivist Michael Shumate. 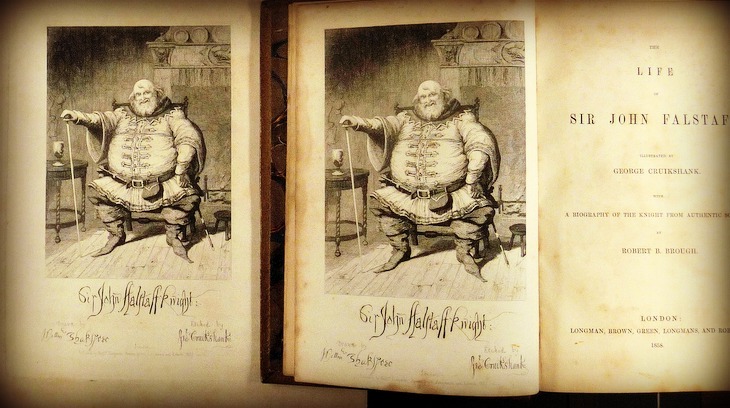 Large-scale printed version of Cruikshank’s etching, next to the printed frontispiece of Robert Brough’s The Life of Sir John Falstaff: A Biography of the Knight from Authentic Sources of 1858. The Falstaff print, a smaller copy of which also appears at the start of Brough’s book, depicts the portly title character, perched on a seat wearing pseudo-chivalric garb and staring out at the viewer, his mouth pursed in what can only be described as a mischievous grin. In addition to the volume’s title, publisher, and other documentary information, the print is inscribed with Cruikshank’s inimitable stylized signature which corresponds directly to the dedication, “Richard Ellison Esq. – with the regards of Geo. Cruikshank” scribbled below. 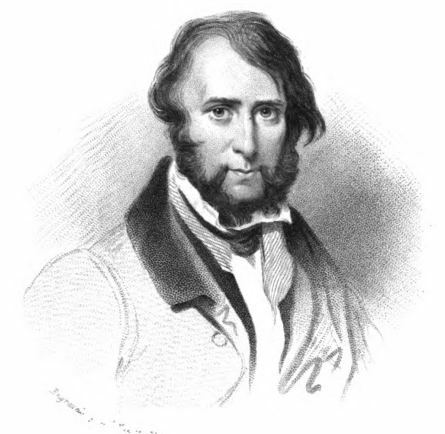 Autograph Signature: George Cruikshank’s signature in a dedication written in pencil along the bottom of the Baker print. How this unique object came into the possession of Frank Baker, a former professor in Duke’s Religion Department, is a mystery; however the prints themselves invite further study. Did this 1857 portfolio serve as a kind of prototype for the images included in Brough’s 1858 book? 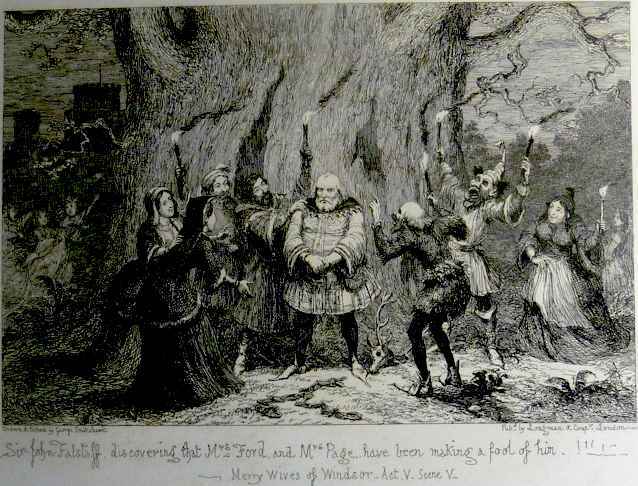 What was the historical reception of Falstaff, and how would Cruikshank’s prints have been understood by nineteenth-century individuals? Indeed, these questions and countless other subjects of interest to art historians, British scholars, and literature students emerge in this visual document. Fortunately for those who, like myself, are intrigued by Cruikshank’s work and would like to learn more, Duke Libraries maintains a number of different sources on the topic, located at both the David M. Rubenstein Rare Book & Manuscript Library and within Lilly Library’s collection. In addition to the Cruikshank materials, the Baker Collection of Wesleyana contains more than 10,000 visual documents including portraits, landscapes, maps, and many other fascinating scenes. Elisabeth Narkin is a doctoral student in Duke’s Dept. of Art, Art History and Visual Studies. She is also a student assistant in Rubenstein Technical Services. Previous PostKeep All You Wish: The Photographs of Hugh MangumNext PostSo, how do you move over 150,000 rare books?